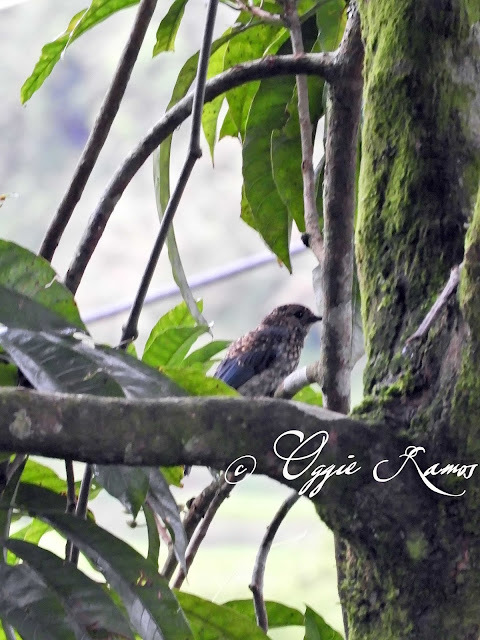 One of the fringe benefits of staying longer than the customary overnight trip to Maligcong is the sighting of so many birds. 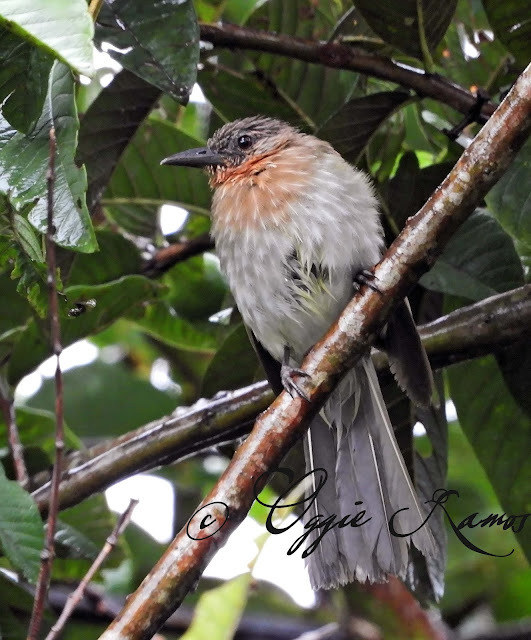 Some just hover close to Suzette's Maligcong Homestay or keep coming back to the fruiting trees and plants that you can opt to stay within the compound and patiently wait for the rains to let up. It's easy to miss out on the birds when you've got only a day and a night to explore the terraces leading up to the school and Favarey, go up Mt Kupapey, and perhaps, if your knees allow, hike to Mt Parutan (erstwhile known as Mt Fato). I know I did during my first few excursions to Maligcong. But notice them I did after I kept coming back and spending some mornings or late afternoons on the veranda or walking along the main road before sunset. During our last visit in March, there were plenty of Rufous-bellied Swallows sweeping through the treetops, some even swerving close to human observers as if entertaining us with their flying prowess. There were even mud nests in some of the eaves of the houses, their preferred nesting method as swallows have small claws more suited to hanging on walls/vertical surfaces than perching on trees. Then, there was also an incident when the kids found a nest of a blue-black bird under the eaves. 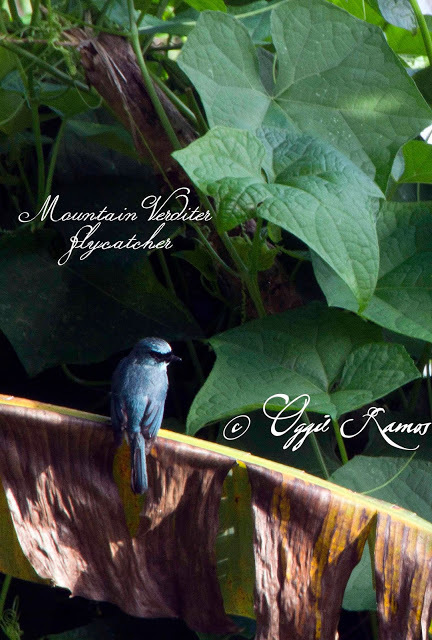 We later found out it was a Mountain Verditer Flycatcher, which I think, is a seasonal visitor. Can't blame the kids as it's easy to lump birds in one category especially if they see them here all the time. The incident struck a chord in me, and I thought that perhaps, we can find out more about what birds frequent the place, perchance to help goad the locals preserve their place and the birds' habitat. Perchance to draw eco-tourists who would bring, not the usual ruckus and noise plus trash (and sorry to be blunt, trashy behavior), but an appreciation of the environment, the local ecology. In the light of illegal logging activities in the area, perhaps this type of tourism can spur the locals to preserve their trees/forests/habitats. Maybe, it's just a pipe dream but hey, let's give it a fighting chance, let it take flight instead of clipping its wings before it can take off. In the meantime, it's interesting to observe and appreciate the flying treasures of Maligcong. 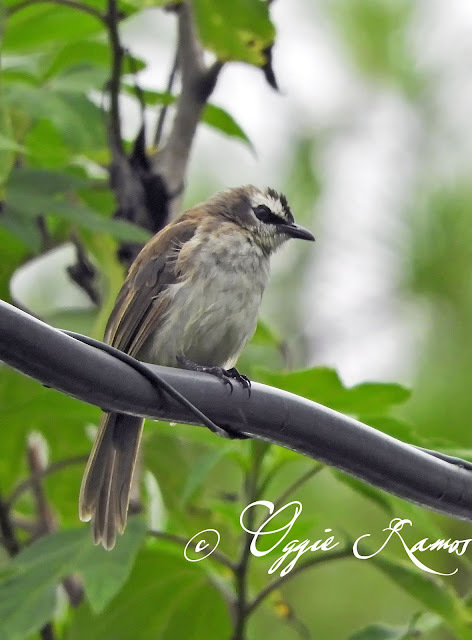 Typhoon Inday may have kept me indoors most of the time during my week-long recharging break in Maligcong but in between squalls and rainy spells, I've managed to sneak in images of Philippine Bulbuls (Hypsipetes philippinus, a local nightingale), Mountain White-eye (Zosterops montanus), Olive-backed Sunbirds (Cinnyris jugularis, local counterpart of hummingbirds), wow, even a pair of Philippine Pygmy Woodpeckers (Yungipicus maculatus). 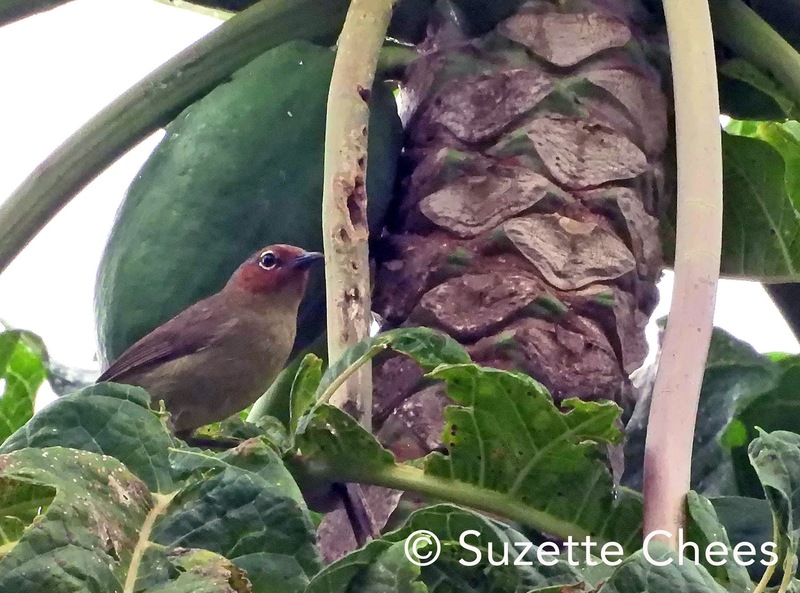 Suzette even photographed a Chestnut-faced Babbler (Zosterornis whiteheadi) high up the papaya plant right in her own front yard! On the morning I was set to leave, I heard loud cackles and upon exiting the bathroom, I saw a Pygmy Woodpecker feeding on ripe chili peppers. By the time I got back from the room with my other camera, he flew off to a nearby tree, out of sight. Sigh. 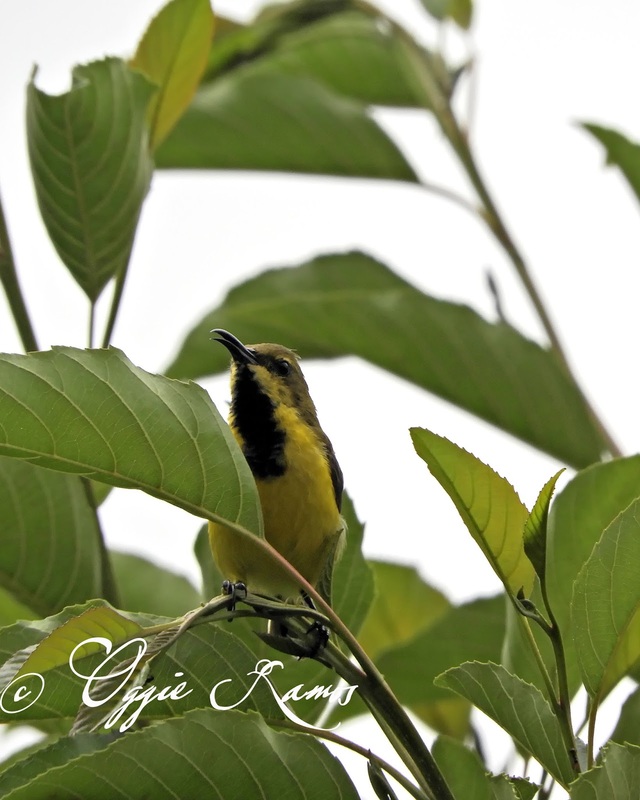 Next time I'll look out for him as well as the reddish-orange bird I espied along the main road while out birding with the homestay dogs, Maku and Tam-Tam. In the olden days, the village elders/shamans or mumbakis take their cues from nature, the birds included, for omens before heading out, going to war or a hunt. 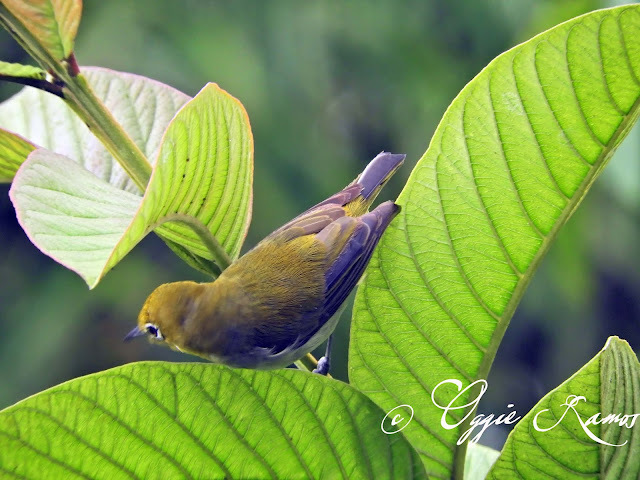 A bird whistling this way or that on the path leading to a hunt, for example, can mean proceeding or turning back home. In these modern times, it's easy to forget this animist past when humans are more attuned to the natural world. Kind of like the Native Americans (erstwhile referred to as Indians) of old who can predict the weather or foretell a calamity by listening and looking at the signs that nature freely gives. Makes you wonder who's better off -- the younger generation who depends on their smartphone apps for the weather forecast or the older generation who can tap into the natural vibe. In any case, I'm having fun birding as it's a hobby that lets nature seep in. You have to go out there and immerse yourself in the environment instead of merely peeking through a lens from afar. It's also a challenge to see beyond the obvious, seek out what eludes the casual observer and visitor, like seeing the forest for the trees. Hopefully, this fascination will be contagious enough to entice the locals to appreciate the living treasures they have.